The Ultimate Bar Accessory (Mixology is an Art That Rewards Precision). Following the end of Prohibition, Albert F. Saunders designed the "Modernistic" line of premium barware for the Benedict Manufacturing Company of Syracuse, New York. Proper, standardized measuring tools were in demand by professional bartenders so each cocktail would be the same for each guest, no matter who was behind the stick. 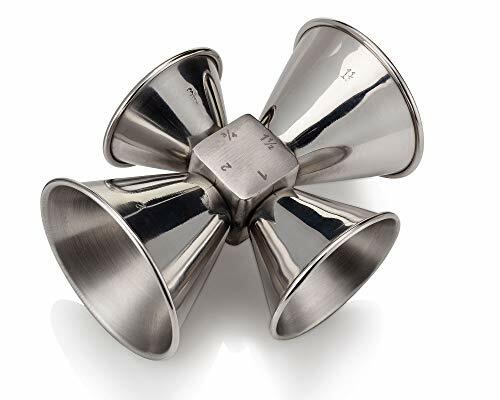 The original Benedict 4-Way Cocktail Jigger is the ultimate bar accessory, faithfully reproduced in sturdy, highly-polished stainless steel, constructed with a perfectly-weighted center cube for balance and ergonomics, a flattened interior base to prevent excess pooling of left over liquid, and marks to identify accurate measures of the 2, 1 1/2, 1, and 3/4 ounce bells. Extremely Limited Edition. If you have any questions about this product by HISTORY COMPANY, contact us by completing and submitting the form below. If you are looking for a specif part number, please include it with your message.